HomeReviewsMoviesCan You Make It Through THE MAZE? With Art Director William Cameron Menzies at the helm and design inspired by Salvador Dali, 3D horror film THE MAZE should run on all pistons, right? Executive producer Walter Mirisch was among the first to see the cinematic potential of Maurice Sandoz’s 1945 novel, “The Maze.” “The most interesting thing about the book,” he said, “was that it had been illustrated by Salvador Dali. The artwork was fascinating.” With its roots in a 19th century tale about mysterious goings on at a Scottish castle, “The Maze” was subsequently adapted for the screen by Daniel Ullman, one of his seven credited screenplays from 1953, and stepping in as director was the acclaimed, Oscar-winning art director William Cameron Menzies (who had been directing since the early 1930s). Known for the depth and graphic richness of his intricate production design — exhaustive, prodigious, and ranging across a wide variety of genres — Menzies had won the first Academy Award given for art direction in 1929 (a shared award for his work on The Dove and The Tempest, from 1927 and 1928, respectively), and a decade later, he received an honorary Oscar for his color contributions to Gone with the Wind (1939). In terms of visual prowess if nothing else, Menzies was well-suited to process Sandoz’s haunting story, situating the picture in the gothic confines of a foreboding fortress and applying abundant decorative invention. What’s more, this realization was to be rendered in the latest movie fad, 3-D, a rather gimmicky device at the time and one Menzies had already experimented with when directing two shorts, Acrobatiks and Fun in the Sun, both of which were also released in 1953. And yet, even though all signs pointed to an accommodating, promising venture, the end result is nevertheless an ultimately unfulfilling experience, more valuable as a modest document of its cast and crew and as an imperfect example of 3-D’s preliminary promise and its frequent misapplication. 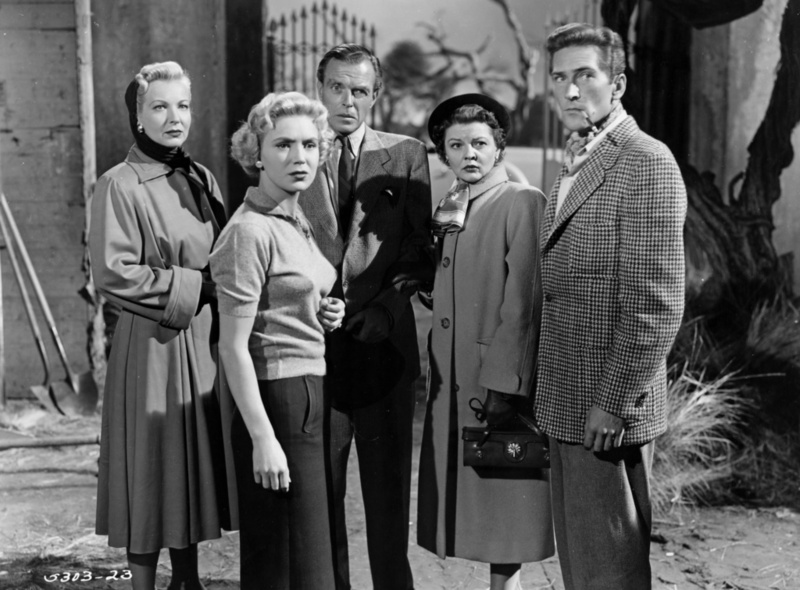 The Maze begins as Gerald MacTeam (Richard Carlson) spends a night out in Cannes with his young fiancé, Kitty Murray (Veronica Hurst), and her aunt, Edith (Katherine Emery). As the couple plans for their imminent marriage, Gerald receives an urgent message calling for his return to Craven Castle, his family’s ancestral abode. Gerald’s uncle is apparently quite ill, and as Gerald is next in line for the baronetcy, the nephew must attend to the situation. Months of silence pass, until one day a cryptic message is eventually received — sent, curiously, to Edith and not Kitty. Gerald calls off the engagement and his ambiguous note speaks ominously of impending death. Edith is suspiciously pessimistic (or maybe she’s just plain suspicious), but Kitty, who talks her aunt into paying the now-secluded Gerald a visit, is optimistic and perseverant. 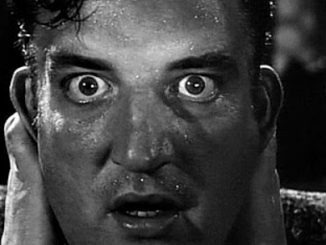 Early in the The Maze, and thankfully less often as the picture plays out, Edith breaks the film’s progression to directly address the audience and narrate what occurred during this menacing episode in her life. It’s not really necessary, and Menzies would have been better off showing not telling what transpired (which he generally does anyway), but it does give Emery a chance to appear as the somber and woefully cautionary voice of authority, conveying from the off the dominant traits of her character, namely her dread and her emotional distance. 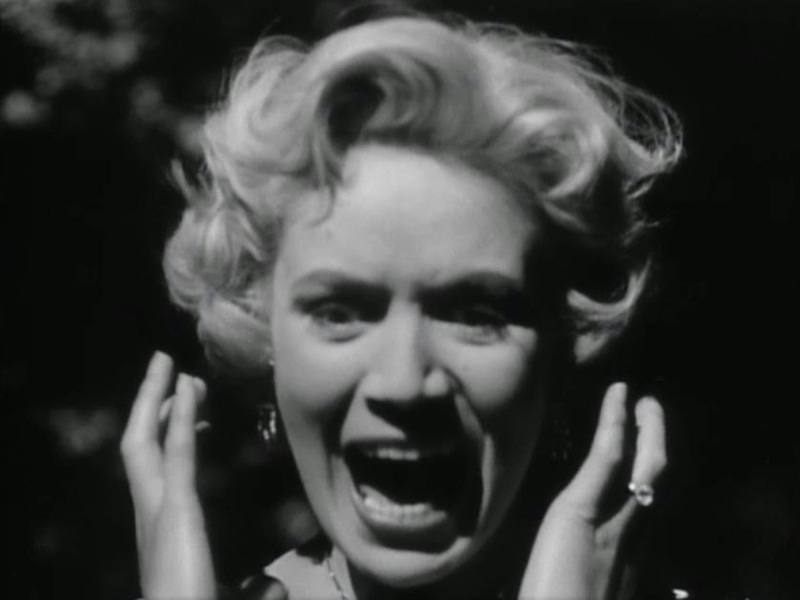 Setting the perilous scene, these grave recitations are Emery’s moment to shine, isolated and commanding as she is in a distinctly angled frame (it was her last of just 12 screen appearances). 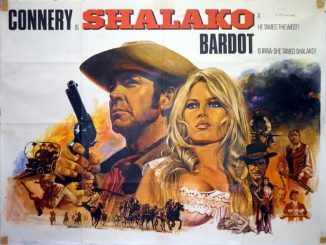 Otherwise, it is Carlson and Hurst who dominate the film. Carlson’s Gerald is, in the beginning, the epitome of a prim, decent gentleman, and his charming manner is established promptly and emphatically, the better to stand in marked contrast to his reserved, borderline cruel comportment later in the picture. As much as Carlson may change disposition, and it’s basically from one extreme to another, Hurst remains fundamentally firm. She is eager, curious, and intrepid, borderline stubborn, in her case, but resilient all the same. She’s an easily approachable heroine and Hurst is a suitably appealing actress. What’s especially underappreciated, though, as an aspect of The Maze and of Kitty in particular, is her reason for pushing forward and wanting to help Gerald. Her desire to solve the mystery of his transformation, and to endure the castle’s persistent disquiet, is born purely and admirably from an unyielding love. It gets lost in the atmospheric moodiness of the picture, and in wake of its muddled revelation, but Kitty’s unaffected love is truly the film’s driving force. 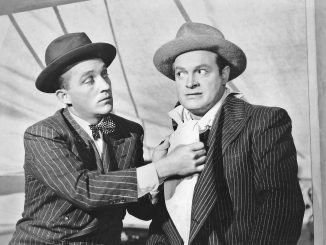 Given the dual “Production Designed and Directed by” credit, Menzies is skilled in his careful use of shadow and layered composition, working in depth with cinematographer Harry Neumann to accentuate the draping cobwebs, the flittering plastic bats, and the recurrently unbalanced alignment of characters in the frame. 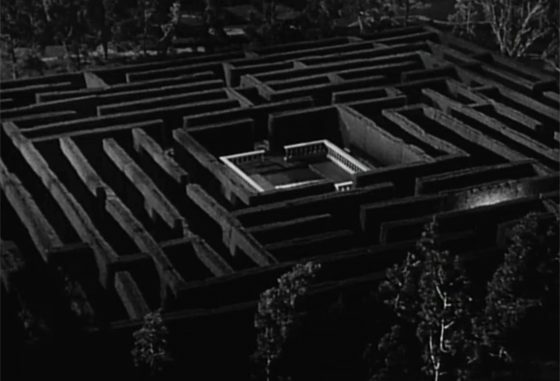 The Maze is at its tantalizing best, however, when suggesting something amiss, from the castle’s enforced detention, with windows sealed off by cement blocks, doors kept locked at night, forbidden towers, and a padlocked maze, to the passing mention of those who came to Castle Craven before, like a recently deceased cleaning woman whose indefinite demise was chalked up to “heart failure” (she was told not to go into the maze, affirms one of the servants). The castle has no electricity and no sign of modern conveniences, and when Kitty encounters a wandering gardener and tells him where she is staying, his cagey response is simply, “I wish you the best. I’ll pray for you.” Further examples of cleverly deployed insinuation are the allusions to what might be prowling on the premises; these suggestions are cued by Gerald’s research into Teratology (“The study of monstrosities”) and the inclusion of amphibious footprints, seaweed, and a bowl of tomatoes, as well as the aural hints of shuffling, rustling paces and splashing water. But then there’s the maze, which, despite the film’s title, has little to do with what occurs and is only at the very end utilized in any substantial way. And then, speaking of the end, there is the film’s concluding reveal, a phenomenally laughable letdown: unsatisfying, not worth the wait, and doing an injustice to the movie’s more laudable qualities. The Maze was an Allied Artists production, but with this faulty finale, it resembles a picture from the studio’s inauspicious Monogram heritage. It’s also a textbook example of why, in a horror film especially, even one as generic as this, some things are best left unseen.